Youth in Education explores the multiple, interrelated social contexts that young people inhabit and navigate, and how educational institutions cope with increasing ethnic, cultural and ideological diversity. Schools, families and communities represent important settings in which young people must make successful transitions to adulthood, and the classroom often becomes a battleground in which the… se contexts and values interact. 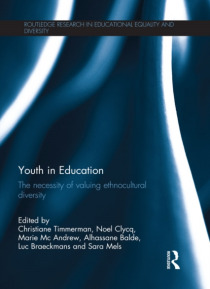 With contributions from the UK, Belgium, Germany and Canada, the chapters in this book explore rich examples from Europe and North America to suggest strategies that can help to counter negative perceptions, processes of stigmatization and disengagement, instead prioritising peer support and cooperative learning to give pupils a renewed sense of worth.This book takes the growing ethno-cultural diversity in education systems to heart and studies the various related educational processes from a multidisciplinary and multi-method approach. It aims to offer more insight into underlying mechanisms that are often implicit, but can be important factors that positively or negatively influence educational trajectories and outcomes. It is essential reading for researchers, academics and postgraduate students in the fields of education, sociology, higher education, policy and politics, and social and cultural geography.